Whether you have recently been appointed as a group leader or are a battle-scarred veteran, you know that managing professional people is difficult! In this unique handbook, Patrick J. McKenna and David H. Maister argue that leaders will best enable their people to achieve peak performance not by managing them, not by leading them, but by inspiring them. The authors show you how to actually add value as a group leader or induce people to accept your guidance, even with intelligent professionals who are often free-agents accustomed to having automony to work on grueling assignments with little supervision. They also give advice on how to handle those oh-so-talented but oh-so-annoying professionals who exhibit attitude problems or are just exceedingly difficult to work with, when you need them but they tend to needle you. The lessons and learning presented here will give you insights and action tips to help you provoke and inspire your people to their full potential. How, exactly, do you add value as a group leader? The reality is that a leadership role is fundamentally different from the individual contributor role. A leader has fundamentally got to be somebody who is effective at making things happen for other people. It's a real different mind-set in terms of what you do and how you impact the business. A leader has to bring a certain energy and optimism to the business. Part of our job is to build energy and enthusiasm. A leader must create a sense of shared ownership. The kinds of people we're managing want to feel like they are owners and not employees. Another key ability is to assess people and determine what's going to be the right role for each individual that meets their needs and also allows them to contribute effectively to the organization. We could not agree more with these comments. Your job as a group leader is to help your people, and your team, win. Prior to becoming a group head, many people will have been asked to spend their whole working lives focusing on their own individual performance. The transition to being responsible for the performance of others is a difficult one for many to make, particularly since, in all likelihood, they still carry some client-service or production responsibilities. There is an issue here both of attitude (willingness to focus on other people and their success) and of skill (the ability to win influence over other people without being domineering). Skills can be taught; attitudes are harder to change. To be effective, a leader must show he truly cares about others -- not only caring what the employee does but, as important, how he does it. I have seen leaders who are consumed with themselves and their personal goals. This is especially common in high-tech services. They don't have time nor do they take the time for coaching, as they are goal-oriented and desire results through technical solutions. In the high-tech services industry, technicians as well as managers, for the most part, fall into the category of loners. They are individuals who would rather work independently. That's why they choose a technical field and not the sales profession. This situation creates a challenge for effective teaming. Most technical teams I've managed have all the correct ingredients for success, but they try to achieve team results through individual efforts. The best group leaders see themselves as catalysts. They expect to achieve a great deal, but know that they can do little without the efforts of others. It is challenging to manage a group of people with different skills, diverse experiences, a variety of work styles, and sometimes, conflicting priorities. Casey Stengel, the renowned former manager of the New York Yankees, once said, "Getting good players is one thing. The harder part is getting them to play together." As we shall see, it requires commitment, curiosity, and courage. In order to help other people succeed, you will need a willingness to get most of your fulfillment from the success of others and a special set of skills: the ability to influence other people's emotions, feelings, attitudes, and their determination. It's significant that I have two business cards. One is mine. The other is the group's. There are twenty lawyers on that group card, and it fits into the client's pocket just as easily as mine does. On that card, the client can find the right lawyer for the right question. Subliminally, the very existence of the card sends a message about the importance of the group as a group. So, how do you help other people succeed (and play as a team)? Part of the answer may be about substance or content (they don't know what to do or how to do it), but this is rarely the biggest issue. Most often, you will be working with highly talented people who do know what to do and how to do it, but just aren't doing it. The causes may be numerous (fear, suspicion, lack of drive, attitudes, problems at home, or structural firm impediments) and you will find that most of the barriers have to do with feelings, attitudes, and emotions. Your role, therefore, and your essential skill, will be to help people fulfill their potential by influencing these feelings, attitudes, and emotions. If you accomplish this, the raised performance level will result (among other things) in greater financial success for your people, you and your firm. Note, however, that while money (or profitability) may be your goal, it is not what you must manage. What you must manage in order to get money is the energy, drive, enthusiasm, excitement, passion, and ambition of your people. Your primary skill (and the test of all your activities) must be whether or not you are able to raise the level of commitment and drive of those you influence. How would you rate yourself at each of these? How would those you lead rate you? So, you are the leader of your group! Your goal is to help, but what do you actually do to accomplish this? Which of the following possible activities are you expected to do? Do your team members expect you to do these things? Do those you report to agree that you should be doing them? 1. Spend unscheduled, informal time with individual people (senior and/ or junior), serving as coach, to help them develop themselves and their practice. 2. Be knowledgeable about the development of junior people and be ready to suggest reassignments between projects in order to build skills and advance their careers. 3. Be in touch with other group members' clients to help them grow relationships, and to monitor client satisfaction and act as a conscience for everyone to excel at client satisfaction. 4. Help members of the team differentiate themselves from other competitors in a meaningful way that clients recognize and value. 5. Help people to stay current with the trends affecting the client industries they serve, the changes that will affect these clients, and their demand for the group's services. 6. Monitor the profitability of assignments conducted by group members and discuss results with them. 7. Devise methodologies to capture and share knowledge acquired while serving clients both within the group and across the firm. 8. Help the group explore new and innovative ways of using technology to better deliver services and reduce costs to clients. 9. Spend time recruiting, interviewing, and attracting potential recruits (junior and senior). 10. Spend time following up and actively helping members of the group execute their planned activities. 11. Initiate and run regular meetings to collectively plan the group's activities and initiatives for the coming quarter. 12. Conduct formal performance appraisals of other (senior) people in the team for purposes of compensation. 13. Conduct counseling sessions with people on the basis of these performance appraisals. 14. Celebrate individual and group achievements -- the minor wins, not just the home runs; the good tries, not just the successes. a. Which of these activities are most likely to raise enthusiasm, excitement and, hence, performance? b. Which of these activities do those you counsel (or coach or lead) accept as valid (i.e., agree that you should perform them)? c. Which of these activities do your superiors expect you to perform? d. Have we left activities off our list that you think should be part of your leadership role? What else could you be doing that would raise the performance of your group and the individuals within it? A group leader does not have to do all of the items we have discussed here. There are many versions of group leadership. However, if the group and the leader are to succeed, it is necessary to agree upon (and write down) the leader's role, responsibilities, accountabilities, and performance measures. You need to come to agreement both with those you supervise and those you report to. It is remarkable how infrequently this is done. (We discuss in the next chapter additional things that you need to negotiate with your firm leadership to fulfill your role properly.) The single biggest (and most certain) source of failure for a group leader is not having agreement in advance about what he or she should do! Since many professional firms (and professional groups within corporations) do not have a history of activist group leaders, it is essential that to arrive at precise answers to these questions. You may think that everyone understands your role, but we have learned that it is safe to assume that while each person may be absolutely clear on what you should be doing, there as many different views as there are people you must deal with. Group leaders cannot and must not attempt to impose their own view of their role on others: this will be doomed to fail. In a professional environment, people must cede permission to be coached, and this can only be done if the role, and its limits, are agreed upon and well communicated in advance. Many management texts, and many of our clients, suggest that one key contribution of a leader is to provide or create a "vision." We are skeptics here, not on any theoretical grounds, but simply because as longtime consultants we have seen many professional environments, and have rarely met managers or leaders who have pulled this approach off. To us, a leader talking about his or her vision sounds too much like "Follow Me!" -- an appeal that is unlikely to work in professional environments. We concede that there may be those individuals who, through personal charisma or the painting of an irresistible future, can get large numbers of professionals to follow them. We just don't think many people can pull it off. We call it "The Moses Strategy" -- going up into the mountain, receiving the word of God, and bringing it back to the children of Israel, saying "Here is the word of God. Get excited!" If you remember your Bible, you may recall that even Moses had to do it twice before he could get the attention of his audience! Our point of view, based upon the most effective managers we have seen, is that they don't say "Follow me!" Instead, they say "Let me help you!" The management writers call this "servant leadership." The key point is that the central goal of either approach is to get your people enthused, excited, and energized. Unless you have a very special skill, then we suggest you focus on what excites each of your people, not (just) on what excites you. A business group is like a sports team, filled with talented athletes who will only win if they truly fulfill their potential. People in business, like athletes, when left to their own devices, don't accomplish as much as they do when they are supported by a good coach. The best managers really do add a very special value. First, through their actions, individual people accomplish more, and focus on more important things, than they would if left to their own devices. Second, the talents of powerful individuals are shaped into even more powerful teams, learning from and supporting each other. How do good coaches achieve results? Effective practice leaders recognize that you rarely "turn on" people (or get them to change) through speeches, vision statements, or inspirational group meetings. They know that the only truly effective way to influence people is one-on-one, i.e., highly individualized, closed-door counseling. Above all else, they pay attention to the individual. They are close enough to what the individual is doing to be able to offer substantive suggestions. They are always "dropping by" to discuss "how's it going?" Effective coaches go out of their way to celebrate successes and triumphs. They make constant use of approval, visibility, recognition, and appreciation. However, to be effective, good coaches must also be demanding. When a good athlete successfully jumps over the high bar, a good coach celebrates the accomplishment, and then -- raises the bar! ("Come on, you can do it.)" Coaches must be simultaneously chief cheerleader and chief critic -- one without the other is insufficient. Part of the skill of coaching is knowing how high to raise the bar, judging for each individual, separately, what next challenge will be stretching but achievable. Good coaches build teams. Since most players will probably be more focused on their own personal performance, it is up to the coach to look out for the overall best interests of the group. The coach must identify opportunities for joint activities. This inevitably involves the coach in trading favors. ("Help us out on this one, and I'll do my best to look after you next time.") Good coaches pay significant attention to how the group's resources are being deployed, and whether or not all the bases are being covered. Leaders are needed to be the guardians of the long-term. They are valuable when they act as the conscience of their colleagues: not necessarily giving them new goals, but helping them achieve the goals they have set for themselves. The manager's role is to be the reminder, the coach, and the supporter as individuals and teams struggle to balance today's pressures with longer-term accomplishments. Patrick J. McKenna is a widely recognized expert on managing professional service firms and a partner in Edge International in Edmonton, Canada, a consulting firm serving professional service firms throughout the world. Mr. McKenna is the coauthor of two Canadian Top 10 management bestsellers, Beyond Knowing and Herding Cats. "This is a timely, easy-to-read work leavened with action plans and examples." 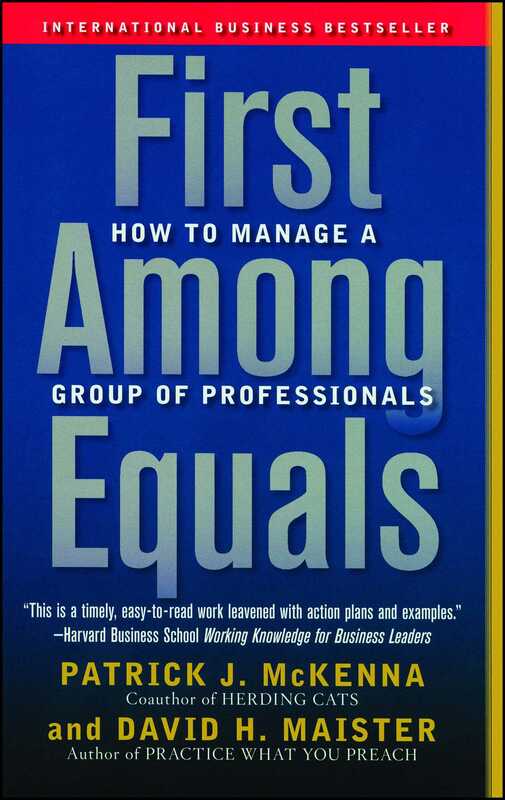 "This book makes a unique and very useful contribution to the field of leadership and management of professionals. It captures both fundamental principles that are characteristic of the better firms as well as offering dozens of practical specifics." "First Among Equals is a treasure chest of extraordinary value. Open it up and between its covers you'll find an unparalleled source of wisdom from two highly seasoned and extraordinarily credible professionals. McKenna and Maister turn the often elusive and obscure concept of leadership into something tangible and accessible. With rich detail and straight talk, they offer practical lessons, usable tools, and case examples from the real world. This is advice and counsel you can trust, and every manager of professionals (no, every manager in any setting) should take it to heart."